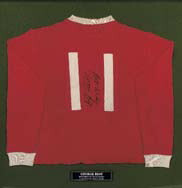 Christie’s Football Memorabilia on 13 September will include the jersey worn by George Best during the Manchester United versus Northampton Town F.A. Cup match in 1970, when he scored six goals and played arguably his finest ever football performance, as well as the jersey worn by Brazilian legend Rivelino in 1970 World Cup Final. The sale will include approximately 250 lots of shirts, boots, caps, medals, programmes and paintings, with estimates ranging from £100 to £35,000. George Best is remembered as one of the finest players to have graced British football; Pelé referred to him as ‘greatest player in the world’ and he earned the title of both European Footballer of the Year and Football Writers’ Association Player of the Year in 1968. He played for Manchester United between 1963 and 1974, winning two football league championships and the European Cup. Christie’s have been holding sales dedicated to Football Memorabilia since 1989, and currently hold two annual sales at their salerooms in South Kensington, London. The following list shows the Top 3 prices realised for Football Memorabilia at Christie’s. For more details visit the Christies web site.